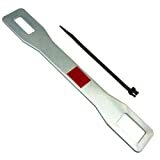 LASCO 13-2512 Emergency Gas Shut Off Tool. Emergency gas shut off tool. Use emergency gas shut-off wrench to shut off gas at the source. Universal fits all gas valves. Easy to use. Great handyman tool. LASCO, LASCO Supply Company Inc, The Preferred Brand! Service, Selection, and Support! Larsen Supply Company is 3rd Generation, Family owned and operated for over 80 years. LASCO packaging includes helpful how to instructions and related project item information. LASCO has the largest retail plumbing line in the industry today with over 7000 packaged and 16,000 bulk SKU’s. Visit our online web site catalog for one of the most complete product listing in the industry.